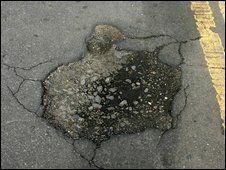 Motorists have been warned it could take councils nine years to mend potholes in the West Midlands, the Asphalt Industry Alliance (AIA) says. Almost £100m was spent on repairs in England last year but after the severe winter weather, thousands more potholes have appeared. When temperatures plunge, water that has penetrated the asphalt freezes and expands causing the surface to rupture. Each pothole costs an average of £99 to fix, the organisation said. Chancellor Alistair Darling announced in his Budget on Wednesday a £100m fund to repair local roads following the bad weather. Earlier this year, the AA reported that pothole-related claims had increased by 400%. Many councils have a "hotline" encouraging drivers to report them, aiming to speed up repairs. A Jetpatcher machine, which can fill one pothole in about five minutes for £60, is also being used by some councils. In its annual road maintenance survey, the AIA said that after two cold winters, minor repair on road would now be more significant. "The extreme weather has again highlighted the fragility of the road network with extensive pothole damage being caused by the freeze-thaw cycle," a spokesman said. "February 2009's extreme weather badly affected the road network condition of 80% of the authorities surveyed. "The full impact of winter 2010 will not be analysed until next year. "However, it is already clear that extensive damage has been caused and roads which previously would only have required minor treatments now require full, more expensive, structural repair."